Unlike the busy fall season, summer tends to be a slower and less-profitable time for martial arts schools. When the weather turns warmer and the kids get out of school, the “summertime blues” set in. Many academies struggle to enroll new members and keep students on the mats. Here’s a reality-based plan on how to chase those blues away and have a fun and successful summer. 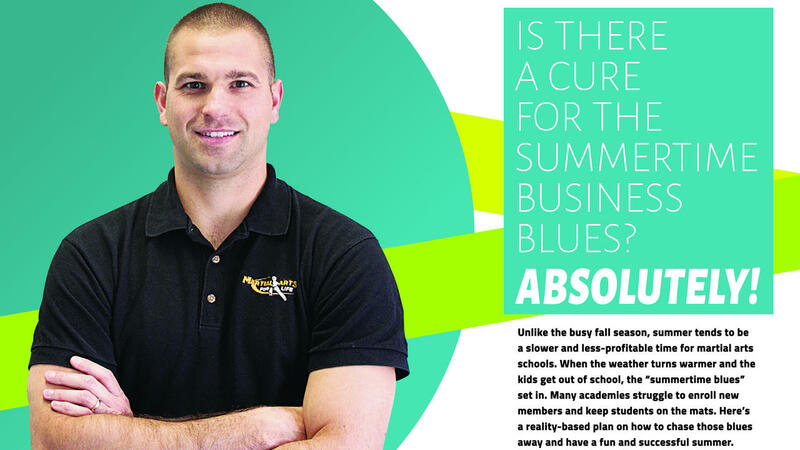 The mere mention of the summer months can make even veteran school owners cringe. Many owners have visions of empty classes, students looking to freeze their memberships, low enrollment numbers and kids that take a break for the summer and never return. Some owners assume that a slow summer is a foregone conclusion. They look to make up ground when the (hopefully) busy back-to-school season rolls around. Others try hard, but find it difficult to enroll students. They have quality classes with exhausted kids who have been at summer camp, the playground or the pool all day. Over two decades of teaching has helped me understand the unique dynamics of summer and how they relate to attendance, retention and enrollment in a martial arts school. Being proactive and entering the summer with a well-laid out plan has led to the summer months being some of our busiest of the year. One of the most important things when planning for the summer is to get started early. In our area, the kids get out of school in late June. So we start building excitement right after Memorial Day, at the end of May. I want my students to be excited to attend class all summer and that won’t happen without some effort. Retention. The number one area is student retention. Obviously, we want to keep as many current students training over the summer as possible. This is especially important when you’re starting out and still working to build your student count. No one wants to see their revenue drop over the summer months, and one of the best ways to prevent that is to focus on retention. Enrollments. No matter how good you are at getting your students excited for summer, there will be those who freeze their memberships or quit during this time of year. Therefore, it’s important to have a well-structured plan for enrolling new students. With the nice weather, there are plenty of external events and opportunities to generate new enrollments. Don’t forget, one of the keys to a busy back-to-school season is laying the foundation during the summer. If your school doesn’t generate many new members over the summer, it will negatively affect your renewal and referral numbers in the fall. Generating extra revenue. Summertime provides many opportunities to boost a school’s gross revenue. Everything from hosting a day camp, selling summer t-shirts, teaching classes off site or partnering with local daycares can lead to a boost in revenue. (See sidebar story, “Promoting Summer Day Camps.”) But, it’s important to choose these types of opportunities wisely. For a list of ideas to help with these three areas read the full article here.